Prague Powder #1 is the essential ingredient for making smoked sausage at home. This curing powder inhibits the growth of Clostridium botulinum which causes botulism, a potentially fatal form of food poisoning. Without this ingredient in a smoked sausage recipe you are putting your health at risk. Moreover, making smoked sausage should always involve an overnight drying process which in addition to drying the casing also allows time for the curing powder to be well dispersed in the sausage. Below I'll cover the two types of smoking (hot and cold) and how to do them. At the bottom of the page I'll also post some links to my favourite smoked sausage recipes. The main reason for making smoked sausage is to add flavour. For sure in olden days smoking was used as a form of food preservation but the anti-bacterial protection provided by smoking is minimal unless the smoking is accompanied by a longer process of dehydration and even then it's the dehydration that is having the greater effect. Cold smoking takes place at temperatures below 30°C or 85°F whereas hot smoking takes place between 60-80°C (140-180°F). Hot smoking cooks the sausage whereas cold smoking does not. The longer you cold smoke, the deeper and richer the smoky flavour, this is not the case with hot smoking. In both cases however, the smoky flavour better adheres to the sausage when the casing is dry so whichever method you choose to use, it's always important to ensure that your sausage is dry before starting out. As stated above, the longer you cold smoke, the more intense the smoky flavour. It's important to keep the temperature in the smoking chamber as low as possible. I prefer to hang my sausage from rods in the top of my smoking cabinet. Using butchers twine, tie a knot at each link and then wrap the links over the rod. Tie two knots between each link leaving a good length of twine on one of the knots. Cut the links and then tie each sausage to the rod with the long end of twine. The reason for hanging is so that the sausages don't touch each other. Wherever there is contact there is no available surface to which the smoke can adhere. Of course you can just lay the sausages out on wire racks but this will leave a cross hatch of light marks on the casing where the smoke has not been able to take hold. Note: To reduce the impact of the marks, turn your sausage every now and then. 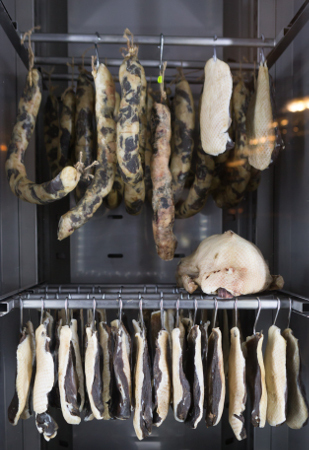 Once hung, the next step for making smoked sausage is to ensure that the casings are dry and the best way to do this is to open all the vents in your smoking cabinet and create some airflow with a fan. This will take a couple of hours but once dry you can now cold smoke. 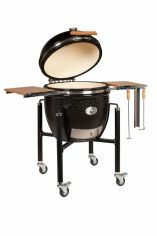 This can be simple as an old wooden cabinet or you can use your barbecue. As you can see above, I've also used a barrel. ProQ, Grillson & A-MAZE-N are the best recognised and most respected. 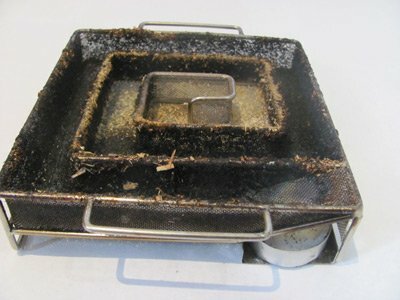 You'll see in the picture below that the cold smoke generator consists of a wire mesh tray channelled into a spiral. Note: The A-MAZE-N has either a zig-zag channel or a tube and these work equally well. Fill the spiral channel with the sawdust or pellets of your choice. It must be sawdust or pellets, the generator won't work with wood chips because chips are too large to smolder. Take care not to overfill, leave a gap of 1-2mm at the top of the channel. Note: If you sieve your sawdust before loading it into the smoke generator you can improve the longevity of the smoke period before you need to re-fill. Underneath the outer most point of the spiral is a tea light candle. Light this and place it in the holder underneath the wire mesh and your pellets / sawdust will initially burn and then start to smolder. Once the pellets / sawdust is smoldering you can extinguish the candle and the airflow from under the mesh will keep the pellets / sawdust smoldering while it works its way along the channel to the innermost part of the spiral. To keep the cold smoke generator smoldering. To ensure continuous fresh smoke because trapped smoke turns stale and leaves an unpleasant taste. 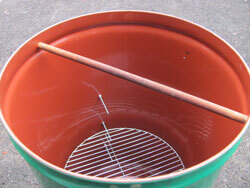 If using your barbecue smoker then you need to keep the dampers open. If using a homemade cabinet then you need to ensure that there is an opening top and bottom (underneath the cold smoke generator) to allow airflow. After the sausage has been smoked it still needs to be cooked. This can be done by any of the methods laid out in my page how to cook sausage or indeed simply by raising the temperature and hot smoking the sausage. The smoky flavour is imparted whilst the sausage is raw so a period of time cold smoking before raising the temperature is desirable. The hot smoking process uses air flow and air is poor conductor of heat. It's not just a matter of your time availability that needs to be considered either. Making smoked sausage this (longer) way means that there's more time for the sausage to dehydrate so if you're looking for a moist juicy result then hot smoking may not be the way to go. Cold smoke to add flavour at temperatures below 30°C (85°F) for anywhere between 2 and 6 hours dependent on how much of a smoky flavour you desire. Now raise the temperature in the chamber to 60°C (140°F) for two hours and this will help your sausage take on a beautiful golden brown hue. As you start this stage reduce the aperture of your top and bottom dampers to the minimum and this will help prevent your sausage from drying out. 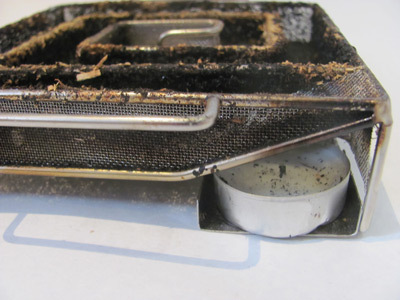 Note: Never close the vents altogether because your smoke will go stale and deliver an unpleasant acrid taste. Next raise the temperature gradually to 80°C (175°F) and continue to hot smoke until the core temperature of your sausage reaches 75°C (165°F). A remote BBQ thermometer is best for this stage. Adding more smoke during these last two phases will have minimal effect on flavour. When you've reached the desired temperature remove them from the smoker, spray them with cold water (or fully immerse them in water) until the core temperature returns to 43°C (110°F) or lower and this will help to re-solidify the fats in the sausage and prevent shriveling. Upon reaching this temperature you can now let the sausages cool at room temperature and you'll see them take on an even deeper brown colour (known as the bloom). An hour later you can put them in the refrigerator but remember that the smoke from your sausage will impart to other contents of your refrigerator.